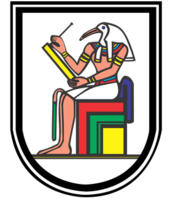 Thoth, the embodiment of knowledge, hieroglyphs, and wisdom. Cairo University (Arabic: جامعة القاهرة‎ Gām‘et El Qāhira, known as the Egyptian University from 1908 to 1940, and King Fuad I University from 1940 to 1952) is Egypt's premier public university. Its main campus is in Giza, immediately across the Nile from Cairo. It was founded on 21 December 1908; however, after being housed in various parts of Cairo, its faculties, beginning with the Faculty of Arts, were established on its current main campus in Giza in October 1929. It is the second oldest institution of higher education in Egypt after Al Azhar University, notwithstanding the pre-existing higher professional schools that later became constituent colleges of the university. It was founded and funded as the Egyptian University by a committee of private citizens with royal patronage in 1908 and became a state institution under King Fuad I in 1925. In 1940, four years following his death, the University was renamed King Fuad I University in his honor. It was renamed a second time after the Egyptian revolution of 1952. The University currently enrolls approximately 155,000 students in 22 faculties. It counts three Nobel Laureates among its graduates and is one of the 50 largest institutions of higher education in the world by enrollment. The university was founded on 21 December 1908, as the result of an effort to establish a national center for higher education. Several constituent colleges preceded the establishment of the university including the College of Engineering (كلية الهندسة) in 1816, which was shut down by the Khedive of Egypt and Sudan, Sa'id Pasha, in 1854. Cairo University was founded as a European-inspired civil university, in contrast to the religious university of Al Azhar, and became the prime indigenous model for other state universities. In 1928, the first group of female students enrolled at the university. At the turn of the century, Egyptian intellectuals and public figures began making calls to establish an Egyptian institute of higher education to provide a modern, professional education to Egyptians. 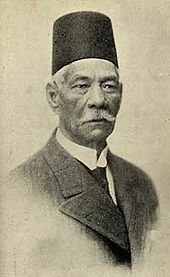 Armenian bureaucrat Yaqub Artin made the first known published reference to establishing an Egyptian university in 1894. In a report, he suggested "the existing higher professional schools could well provide the basis for a university." These higher schools included the School of Management and Languages, established in 1868 (which became the School of Law in 1886), the School of Irrigation and Construction (known as the School of Engineering) in 1866, Dar al-Ulum in 1872, the School of Agriculture in 1867 and the School of Antiquities 1869. Syrian journalist Jurji Zaydan called for an "Egyptian college school" (madrasa kulliya misriyya) in 1900 in his monthly magazine Al-Hilal. He provided two models for this institute of higher education: the Muhammadan Anglo-Oriental College at Aligarh, India, which delivered a Western-style education in the English language, or the Syrian Protestant College (now the American University of Beirut) in Beirut, run by American missionaries. The new school would provide an alternative to the student missions to Europe begun under Muhammad Ali. Controversy surrounding Zaydan’s publications would later prevent him from taking a teaching post at the University. A number of other prominent Egyptians played a role in the university’s foundation. A collection of large landowners, bureaucrats, members of the royal family, and journalists, lawyers, and school teachers including Mustafa Kamil, disciples of Muhammad Abduh such as Qasim Amin and Saad Zaghlul, and eventually Khedive Abbas II and Prince Ahmad Fu’ad I became involved. As Donald M. Reid writes, "Royalist partisans stressed Fu'ad's founding role, Watanists pointed out Mustafa Kamil's call for a university, and Wafdists emphasized the contributions of Saad Zaghlul, Muhammad Abduh, and Qasim Amin." Wealthy Egyptians began to independently pledge funds to the establishment of a university as early as 1905. Following the Dinshaway incident, Mustafa Kamil al-Ghamrawi, a wealthy notable from Beni Suef, pledged 500 Egyptian pounds towards a university in September 1906. Mustafa Kamil published a call for supplementary funds, while Saad Zaghlul and Qasim Amin arranged a meeting attended by Muhammad Farid and 23 other prominent Egyptians. The members of the meeting founded a committee with Zaghlul as vice-president and Amin as secretary, and all but three pledged at least 100 Egyptian pounds towards the university. However, splinters quickly emerged between the Watanists, the disciples of Abduh and the Royalists, leaving the project in the hands of the Palace. By the time of its establishment in 1908, Prince Fuad I was the rector and only one of the men who had met in 1906 remained in the committee. The British, particularly Lord Cromer, had continually opposed the establishment of such a university. Only a year after his departure from Egypt, under Sir Eldon Gorst, was the Egyptian University finally established. The Egyptian educational system remained woefully underdeveloped under British rule. Two decades after occupation, education received less than 1 percent of the state budget. Cromer publicly stated that free public education was not an appropriate policy for a nation such as Egypt, although the funds were found to regenerate the law school in Cairo so Egyptians didn't have to go abroad to obtain legal degrees during Sir John Scott's time as Judicial Advisor to the Khedive. Donald M. Reid speculates that this was due to fear that European-style education would create political unrest or foment opposition to British rule. Cromer also opposed providing financial aid to the university after the private committee began to pursue the matter independently of the British. In its early years, the university did not have a campus but rather advertised lectures in the press. Lectures would be held in various palaces and conference halls. After a grand opening ceremony in 1908, it remained on financial insecure footing for a number of years, nearly collapsing during World War I. Upon its founding in 1908, the Egyptian University had a women’s section but this was closed in 1912. Women were first readmitted to the arts faculty in 1928. Problems during this period also included a lack of professional faculty to fulfill the founders’ educational vision. There were simply no Egyptians with doctoral degrees, the ability to teach in Arabic and a familiarity with Western literature in their fields with whom to fill professorial posts. Thus European Orientalists who lectured in classical Arabic filled many posts until the 1930s. The university also sent its own students on educational missions to obtain the necessary training. First, the university hired Italians Carlo Nallino, David Santillana and Ignazio Guidi, due to King Fuad I’s connections with Italy. Following the departure of the Italians after the invasion of Libya, French orientalists Gaston Wiet and Louis Massignon took up posts on the faculty. The Germans and British were less represented. In 1925, the university was re-founded and expanded as a state institution under Fuad I. The liberal arts college (kulliyat al-adab) of 1908 was joined with the schools of law and medicine, and a new faculty of science was added. 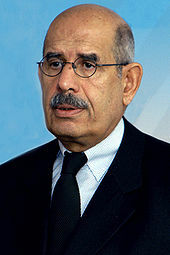 Ahmed Lutfi al-Sayyid became the first president. 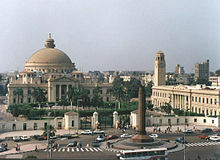 Cairo University is usually ranked among the top universities in Egypt, and one of the top universities in Africa. In QS ranking 2018 Cairo University was ranked the 2nd in Egypt, it was rated the 7th across Africa, and it was rated 481-490 worldwide. In the ARWU 2017 ranking the university was ranked 1st in Egypt and it was the only Egyptian university in the ranking. It was rated 401-500 worldwide. Cairo University includes a School of Law and a School of Medicine. The Medical School, also known as Kasr Alaini (القصر العيني, Qasr-el-'Ayni), was one of the first medical schools in Africa and the Middle East. Its first building was donated by Alaini Pasha. It has since undergone extensive expansion. The first president of Cairo University, then known as the Egyptian University, was Professor Ahmed Lutfi el-Sayed, who served from 1925 to 1941. A new Central Library is planned. 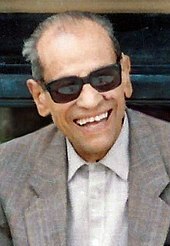 Taher Elgamal, designer of the ElGamal encryption system and considered "Father of SSL"
^ Mariz Tudros (18–24 March 1999). "Unity in diversity". Al Ahram Weekly. 421. Archived from the original on 30 May 2014. Retrieved 28 October 2013. ^ Reid, Donald M. Cairo University and the Making of Modern Egypt. Cambridge: Cambridge UP, 1990. Print. 23. ^ Reid, Donald Malcolm. "Cairo University and the Orientalists." International Journal of Middle East Studies 19.01 (1987): 51-75. Print. 60. ^ "Cairo University Presidents". Cairo University. Retrieved 2 January 2013. ^ New Central Library Archived 2012-03-10 at the Wayback Machine, Cairo University. ^ Rizk, Yunan Labib. "Al-Ahram Weekly | Chronicles | Lady lawyer". weekly.ahram.org.eg. Retrieved 2016-09-29. Reid, Donald Malcolm. Cairo University and the Making of Modern Egypt. Cambridge: Cambridge UP, 1990. Print. Reid, Donald Malcolm. "Cairo University and the Orientalists." International Journal of Middle East Studies 19.01 (1987): 51-75. Print. Wikimedia Commons has media related to Cairo University. Pakistan International School of Cairo was previously in Giza. This page was last edited on 23 April 2019, at 15:22 (UTC).